“Beginnings” are arbitrary, as every storyteller knows. Any event will do, and then the next and the next in a linear sequence of apparent causality until you reach the “ending”, where all the loose strands get tied together into a nice neat conclusion. Or that’s how stories are traditionally told in my part of the world. But in the mud and dust reality of rural arts festivals, “beginnings” are messy, nonlinear blurs between the initial flickering of the idea in the animateur’s imagination and the event’s opening speeches. Times of inspired madness (or desperation? ), enthusiasm, opportunism, strategizing, innovation, alliance-building, creative collaboration, community engagement, inveigling, negotiation, lobbying, fund raising, problem-solving, promotion, tedious logistics, stress, dogged persistence, meetings, meetings, meetings, conflict resolution, physical and emotional exhaustion, and lots of luck, in which seemingly insignificant events can have momentous consequences and big ideas can lead nowhere. I know this from personal experience, because I once founded a rural arts festival in a small country town. One of the maddest and most challenging things I’ve ever undertaken, but we both survived, the festival and me. Especially the festival! So call this my Chaos Theory of Rural Arts Festivals, their sensitive dependence on initial improbabilities, crazy ideas, and unreasonable dreams and desires; and on months, years even, of unpaid (and generally unacknowledged) intellectual, emotional and physical labour. The most critical initial condition for any rural arts festival, however, is the presence of one or more truly frustrated creative thinkers with the passion, skill, incentive and courage (or foolhardiness?) to defy local tradition (or inertia?) by trying something new. Without such people rural arts festivals cannot exist. With them miracles emerge. Cowra Festival of International Understanding: Gamelan Man, a non-traditional Indonesian shadow performance by Jumaadi, with musicians Ria Soemardjo, Graham Apthorpe and Peter Reeves, at Cowra Festival’s Civilian Internment Symposium, 7 March, 2014. More about the Civilian Internment Arts Program and artists involved in a future post. Like the Wirksworth Arts Festival in Derbyshire, England, which “began” over two decades ago, as I’ve reported in earlier posts, with a group of creatives wanting to exhibit and sell their arts and craft work and enliven their local communities. Like the Elvis Festival in Parkes, which “began” with a couple of creative thinkers wanting to spike local commerce in the slowest month of the year, by celebrating The King Of Rock’n’Roll’s birthday. Or like Cowra’s Festival of International Understanding, which “began” fifty years ago with a few creative thinkers wanting to commemorate a mass break-out at their town’s POW camp. The continued success of these and other rural festivals decades after their unlikely “beginnings” ratifies, yet again, Margaret Mead’s oft-quoted aphorism: Never doubt that a small group of thoughtful, committed, citizens can change the world. Indeed, it is the only thing that ever has. But few rural arts festivals can have “begun” as improbably as the one I’m most closely associated with, the biennial Kalari-Lachlan River Arts Festival in Forbes, a small inland river town of some 10,000 people, in central western New South Wales. A region many big city arts professionals and aficionados arrogantly assume is a cultural desert. Who’d ever imagine that a new chamber opera could be conceived and developed in such a peripheral place? Or, more implausibly, that the animateur/librettist of this chamber opera (me) would want to premiere it beside the local lagoon, on a flood-prone site with no direct access to electricity or other amenities, and with insufficient funding and institutional support? Or, yet more bizarrely, that a free arts festival would emerge from such recklessness, as a community celebration of country creativity and resilience after a decade of drought, as the opening gig for the 2011 State Landcare & Catchment Management Forum? And with the new chamber opera, The Kate Kelly Song Cycle, as its headline act? Well, that’s what happened in my home town in 2010/11. But only—and who should be surprised by this in Australia?—because potential sponsors and project partners were much more interested in supporting traditional community arts festival-type activities in the bush than in financing premieres of serious new works of twenty-first century classical music! Indeed, our chamber opera might never have been performed in Forbes were it not for Melbourne philanthropist Julie Kantor and her Annamila Foundation coming to our rescue with just enough cash to bring the professional performers and musical director to town. The rest of us involved in this production, including my collaborator, composer Ross Carey, and the community choristers, contributed our time, labour and expertise pro bono. And so it was that, on 4 September 2011, our Song Cycle was first performed beside the very lagoon in which the historic Kate Kelly’s body was found in 1898. It received a standing ovation. Way back in our festival’s misty “beginning”, we decided to make all events free to the public, as far as possible. We also adopted a Mission Statement, or set of guiding values, which implicitly acknowledged the interconnected challenges small rural communities, such as our own, now faced: Anthropogenic Climate Disruption (global warming), land and water degradation, species loss, economic globalisation, aging and declining population, limited employment and educational opportunities, racism and other forms of discrimination, resistance to new ideas, parochialism, andcultural impoverishment, for example. At the very top of our list of values was Inclusivity, a commitment to ensuring that all people, regardless of their financial circumstances, ethnicity, class, age, gender, colour, political affiliations, sexual preferences, or abilities, could participate in, enjoy and benefit from the River Arts Festival. Even the most marginalised and impoverished groups who often feel excluded from such events. This commitment means no box-office income to off-set expenditures, of course, so our festival is entirely dependent on philanthropic donations, private and corporate sponsorships, grants, crowd funding, in-kind support, sweat equity and good will. A risky strategy, but given the demographics of most rural communities in inland Australia, and the high ideals upon which our Kalari-Lachlan River ‘Republic of the Arts’ was founded, a necessary one. And, so far, it has worked. Our sponsors, donors, in-kind supporters, performers, and the community at large have generally embraced our commitment to inclusivity and a free festival. Even in the stressful months preceding our first festival in 2011, we somehow managed to wrangle sufficient resources to cover not only the festival basics, such as insurance, staging, lighting, sound engineering, electrical generators and mobile toilets etc, but to also to run lantern-making workshops and to involve a Sydney-based theatre professional, Steffo Nantsou, founder/artistic director of Zeal Theatre and resident director with Sydney Theatre Company. The Cabinet concept, one of many innovations from our Kalari-Lachlan Republic of the Arts, has enabled enthusiastic and skilled locals to develop their own projects, or take on the responsibility for whole ‘portfolios’. It has been very empowering for the entire community. In 2011, our first Minister for Aboriginal Inclusion, Wiradjuri descendant Russell Hill, produced an hour-long Welcome To Country (WTC) Spectacular as the first festival’s opening event, for example. Russell and his crew, including staff and students from all the Shire’s schools, expanded the traditional WTC concept to perform stories of Country, from the Dreamtime to the present-day, as scripted from their own Wiradjuri perspectives. This was the first time Wiradjuri descendants had been able to tell their own stories in public in Forbes, on their own terms, since the early twentieth century, when their people were “ethnically cleansed” from the town. 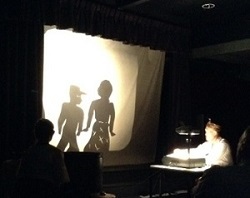 Their production brought both tears and smiles to the audience. Student Aiden Clarke’s reading of former Prime Minister Kevin Rudd’s ‘Sorry Speech‘ was especially moving, as was Forbes North Primary School choir’s rendition of I am Australian in both Wiradjuri and English. This first Welcome To Country Spectacular received the River Arts Festival’s first standing ovation. The WTC and the Lantern Parade have now become our Festival’s signature events, while the arts and crafts component has expanded to include yarn bombing, a sculpture competition, new exhibition spaces, and much more creative sharing, caring and creative collaboration. None of us remembered to count the crowd at this first festival, but Stefo estimated it to be “around two thousand” on the main day. A more than an OK figure surely for the first-ever arts festival in this small country town, especially since our gig clashed with regional football and netball semi-finals! Even Stefo was impressed with what we achieved under his direction. “Given the short lead time, it was extraordinary,” he said. For another local it was “an absolute triumph … jam packed with memorable moments” and “welcomingly inclusive of age, race, creed, colour and ability”, as she wrote in a letter to The Advocate. This correspondent also commended we organisers for “showing that the arts are like the river, both are essential to life lines.” A very apt description of the value of the arts in the bush. Many people remained very skeptical about the value of arts festivals in that first year though, including a number of Forbes Shire Councillors. Arguably the most skeptical of the skeptics was Councillor Ron Penny who, like many country blokes of his generation, knew a great deal about farming, livestock management, agribusiness, and National Party politics, but very little about the creative industries, or the well documented benefits small rural communities could derive from arts festivals. To such skeptics, all Forbes Shire needed to arrest its decline was more rain, more water in the river, and more economic development, as in jobs, jobs, jobs. I believed, however, that people needed more than jobs, jobs, jobs (and sport, sport, sport) these days to entice them to move to, or remain, in small inland towns like Forbes. They needed opportunities to enjoy creative experiences and enrich their lives culturally. They needed creative fulfilment, companionship with like-minded souls, exposure to new ideas, stimulating activities, support to adapt to all the structural and climatic changes inland communities were now facing …. and (at least according to some) good coffee! So, instead of jobs, jobs, jobs (and sport, sport, sport), I was advocating an integrated approach to economic, social, and cultural development to transform Forbes from a town with a then-declining population and too many empty shops, into the region’s cultural hub, with the River Arts Festival as a catalyst for positive change. Our second River Arts Festival in 2013 was bigger and better than the first, and attracted at least twice the number of people. “Spectacular Festival” the front-page of the Forbes Advocate shouted from beneath a super-large colour photo of the Festival’s grand finale, Drumming Up Country. “The lanterns have died out, musicians have packed up and gone home, and everyone is recovering after a huge weekend at the 2013 Kalari-Lachlan River Arts Festival,” Sophie Harris reported in her lead article. “This year’s festival was an astounding success and impressed all who attended the celebration of art and culture in our region,” she wrote. 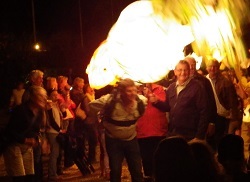 Smiling Forbes Shire Councillors and senior staff being mobbed as they carry the giant dragon lantern at River Arts 2013. Poor quality photo by Merrill Findlay. The Advocate published dozens of festival photos in a centre page spread and on-line “mega-gallery”. Hundreds more photos were posted on Facebook and other social media platforms, many of them showing Forbes Shire Councillors smiling and laughing as they carried giant illuminated paper lanterns around the Lake. Now, having actually experienced a River Arts Festival themselves, even the most skeptical of Councillors had finally “got it”. Including Councillor Ron Penny, who, by this time, was the local Mayor. The Advocate’s Sophie Harris reported his words, and our new Festival president, Margot Jolly, posted the article on Facebook, as enduring proof that I was no longer a “crank”! Such relief. It’s a cliche, I know, but a great weight lifted from my shoulders when that article was published. Thank you Sophie. Thank you Ron. Forbes Shire Councillors are now amongst the River Festival’s most ardent partners in our grand project to transform our town into the region’s cultural hub, into an enlivened and enlivening place where creativity and creative industries can thrive, and where all people, regardless of their ages, backgrounds or tastes, can enjoy rich and fulfilling lives with the same access to the arts and cultural amenities that the 90 percent of Australians who live along the southeast coast now enjoy. Because why should we Inlanders expect anything less than coastal-dwelling city folk? Our River Arts Festival has survived its chaotic “beginning” and has taken off in directions we could never have predicted back in 2011. It is owned and managed by an incorporated not-for-profit community association, Kalari-Lachlan River Arts Festival Inc. It is no longer dependent on its founder. It has deep community support, cash in the bank, and confirmed sponsorship until 2017. And even former skeptics now have high expectations of the next festival and the next. The rural arts festival we struggled so hard to establish in 2010/11 is approaching the “middle” of its true story. Can it survive long enough to catalyse the scale of change we need to ensure that small inland towns can thrive, despite the many challenges they now face? Can our River Arts Festival transform Forbes into the cultural hub for the entire region, a place where everyone, no matter who or what they are, or where they come from, can celebrate country creativity and resilience with truly awe-inspiring arts festivals, which attract not just 2,000 or 4,000 people, but hundreds of thousands? Can it? Will it? Or will it end without ever fulfilling its founder’s dreams? Even thinking about such a “ending” makes me nervous …. So much more work yet to be done. This entry was posted in arts, community arts development, creative industries, cultural planning, Forbes, rural arts festivals, sustainable development, Uncategorized. Bookmark the permalink. ← Yes, but is it an arts festival ….? Great article Merrill! Long live the crazy thinkers……..